I am back again with another Monday Reviews - on a Friday! 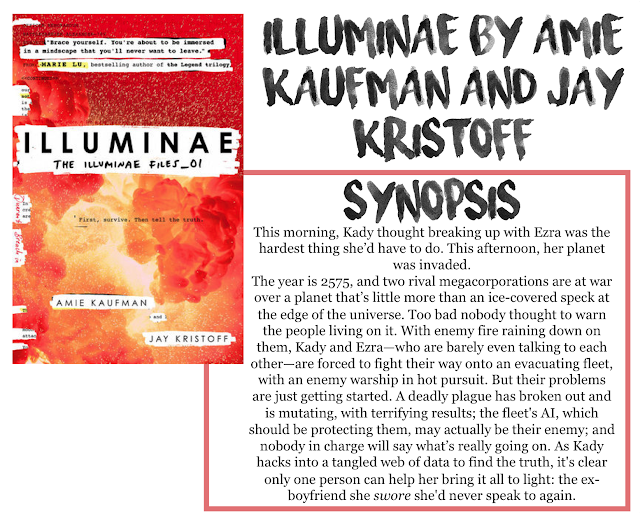 This week, I am reviewing Illuminae by Amie Kaufman and Jay Kristoff! Overall, while I liked this book, it just wasn't my favourite. I think my problem with this book was that there was just so much hype surrounding it, that this book was built so high up, my expectations were too high and I was disappointed. I liked it, but I definitely didn't love it. I enjoyed the layout, documents, recordings, images, I feel like the trend of the novel/graphic novel hybrid is gaining momentum, this was my second book like this in the last couple months, but story wise, it didn't wow me. There were a couple moments where it was intense and suspenseful, and I didn't see something coming but other than that, it was kinda hard to remember what character was on what ship, what tag name was who, with all the names of things and abbreviations, I just couldn't keep it straight. In addition to the hype, the other reason I may not have enjoyed this book as much as most is that I'm not the best audience for this book. It is fairly sciencey, and I'm not a sciencey person. There was a lot of computery-hacker stuff and I feel like I'm just not cut out for the sci-fi, technology novels. Overall, this book was good but not great. I'm still confused about some things, and while the cover is quite nice, I just don't think this book lives up to the extremely high hype. I might get the next book when it comes out, just to see what happens, because there were a few things I did like and a couple things I want to get answered.